Herbal treatments are a very cost effective treatment option for most people, especially those who prefer non needle treatments who want to avoid or get off of prescription drugs. These herbal medicinals may be administered in the form of decoctions, pills, powders, or tinctures. They may also be used as external applications for pain in the form of compresses, lotions, liniments, and plasters. 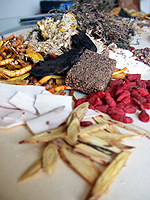 Make your appointment today and discover the healing power of Chinese Herbal Medicine.